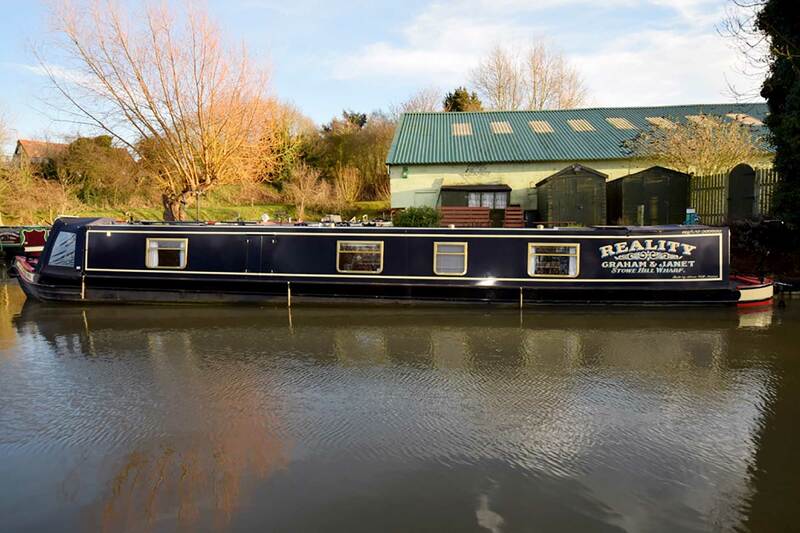 Reality a stunning 55ft semi trad by G&J Reeves/Stowe Hill built in 2003. She has been moored all of her days where she was built at Stowe Hill and has been loved and cared for to within an inch of her paintwork. 6 berths – permanent double berth 4ft 6in wide fixed in aft cabin, a second double berth from the dinette and a further double berth from the L shaped sofa arrangement. Beautiful Stowe Hill carpentry fit out in Ash ply to give a light and pleasing interior. The joinery is to the good standard one would expect of a Stowe Hill boat as all the cupboards, shelving and kitchen units are custom built. The central heating is subtle; no radiators anywhere with the finrad system. In addition there is a high quality Phoenix 2.5kW inverter/charger unit backed up by a substantial bank of batteries. A Travelpower generator provides additional 230v power alongside the shoreline. Propulsion, housed in the easily accessible and sqeaky clean engine room, is delivered by a Beta 43hp diesel unit. Re-painted and blacked in 2014, this beautiful boat feels a lot less than 14 years old and she also feels longer than 55’. Reality is a truly beautiful 55ft semi trad by G&J Reeves/Stowe Hill built in 2003 and a credit to her owners who have had her since new.